Spatial pattern of polar bears relative to reproductive status, habitat and prey distribution. Contacts: Todd Atwood, Ph.D., George Durner, Ph.D. Rode, K.D., J. Olson, D. Eggett, D.C. Douglas, G.M. Durner, T.C. Atwood, E.V. Regehr, R.R. Wilson, T. Smith, and M.St. Martin. 2018. Denning phenology and polar bear reproductive success in a changing climate. Journal of Mammalogy 99:16-26. Rode, Karyn D.; Wilson, Ryan R.; Douglas, David C.; Muhlenbruch, Vanessa L; Atwood, Todd C.; Regehr, Eric V.; Richardson, Evan; Pilfold, Nicholas; Derocher, Andrew E.; Durner, George M.; Stirling, Ian; Amstrup, Steven C.; St Martin, Michelle; Pagano, Anthony M.; Simac, Kristin S.
Butterworth, Andy; Durner, George M.; Atwood, Todd C.
Durner, G.M, and T.C. Atwood. 2017. Chapter 23 Polar bears and sea ice habitat change. Pages 419-443 in A. Butterworth (ed.) Marine Mammal Welfare - Human Induced Change in the Marine Environment and its Impact on Marine Mammal Welfare. Springer International Publishing, Switzerland. DOI 10.1007/978-3-319-46994-2. John P. Whiteman, Henry J. Harlow, George M. Durner, Eric V. Regehr, Bryan C. Rourke, Manuel Robles, Steven C. Amstrup and Merav Ben-David. 2017. Polar bears experience skeletal muscle atrophy in response to food deprivation and reduced activity in winter and summer. Conservation Physiology. Vol 5. doi:10.1093/conphys/cox049. Pagano, Anthony M.; Rode, Karyn D.; Cutting, A.; Owen, M.A. ; Jensen, S.; Ware, J.V. ; Robbins, C.T. ; Durner, George M.; Atwood, Todd C.; Obbard, M.E. ; Middel, K.R. ; Thiemann, G.W. ; Williams, T.M. Atwood, Todd C.; Marcot, Bruce G.; Douglas, David C.; Amstrup, Steven C.; Rode, Karyn D.; Durner, George M.; Bromaghin, Jeffrey F.
Amstrup, S. C., G. M. Durner, A. S. Fischbach, K. S. Simac, and G. W. York. 2011. Polar Bear Research in the Beaufort Sea. Proceedings: Bear Taxanomic Group Workshop on Ursids in Captivity. American Zoological Society Annual Meeting. Detroit, MI, USA. Bergen, S., G. M. Durner, D. C. Douglas, and S. C. Amstrup. 2007. Predicting movements of female polar bears between summer sea ice foraging habitats and terrestrial denning habitats of Alaska in the 21st century: Proposed methodology and pilot assessment. 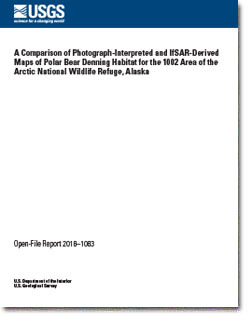 USGS Administrative Report, 24 p.
Durner, G. M., S. C. Amstrup, G. York, E. V. Regehr, K. S. Simac, T. S. Smith, S. T. Partridge, T. W. Bentzen, K. S. Amstrup, and D. C. Douglas. 2005. Report on research progress in Alaska. Proceedings: 15th Annual meeting of joint commissioners and technical advisors of the Inuvialiut Game Council and North Slope Borough. Edmonton, Alberta, Canada. Amstrup, S. C., G. M. Durner, E. V. Regehr, G. W. York, K. S. Simac, T. S. Smith, S. T. Partridge, and D. C. Douglas. 2004. Polar Bear Research in the Beaufort Sea. February 2004, Winnipeg, Manitoba. Proceedings: Canadian Polar Bear Technical Committee. Amstrup, S. C., G. M. Durner, A. S. Fischbach, G. W. York, K. S. Simac, T. S. Smith, S. T. Partridge, and D. C. Douglas. 2003. Polar Bear Research in the Beaufort Sea. February 2003, Edmonton, Alberta. Proceedings: Canadian Polar Bear Technical Committee. Durner, G. M., S. C. Amstrup, R. Neilson, and T. L. McDonald. 2003. The use of sea ice habitat by female polar bears in the Beaufort Sea. Pages 60-61 in Proceedings of the Ninth MMS Information Transfer Meeting. MMS OCS Study 2003-042, 118 p.
Amstrup, S. C., G. M. Durner, A. S. Fischbach, K. S. Simac, and G. W. York. 2002. Polar Bear Research in the Beaufort Sea. Pages 109-125 in edited by N. J. Lunn, S. Schliebe and E. W. Born, (eds. ), Occasional Paper IUCN Specialists Survey Commission 26. Proceedings: 13th Working Meeting of the IUCN/SSC Polar Bear Specialist Group, 23-28 June 2001. Nuuk, Greenland. Durner, G. M., S. C. Amstrup, A. S. Fischbach, G. S. York, and K. S. Simac. 2002. Polar bear research in the Beaufort Sea. Proceedings: Canadian Polar Bear Technical Committee, 9-10 Feb 2002. Iqualuit, Canada. Amstrup, S. C., G. M. Durner, A. S. Fischbach, K. S. Simac, and G. W. York. 2002. Polar Bear Research in the Beaufort Sea. Proceedings of the Bear Taxanomic Group Workshop on Ursids in Captivity. Annual Meeting of the American Zoological Society, Detroit, MI, April 27 - 29, 2001. Amstrup, S. C., G. M. Durner, and T. L. McDonald. 2002. Volume III, Appendix J 1, Liberty Development and Production Plan. Draft Environmental Impact Statement. Minerals Management Service, Alaska Outer Continental Shelf Region OCS EIS/EA MMS 2001-001. Amstrup, S. C. and G. M. Durner. 1998. Polar bear research in the Beaufort Sea. Pages 131-139 in A. E. Derocher, G. W. Garner, N. J. Lunn, and O. Wiig, (eds.). International Union for Conservation of Nature and Natural Resources, Gland, Switzerland. IUCN/SSC Occasional Paper 19. 159 pp. Proceedings: 12th Working Meeting of the IUCN/SSC Polar Bear Specialist Group Oslo, Norway. Amstrup, S. C. and G. M. Durner. 1998. Identification of polar bear den habitat in northern Alaska. Pages 141-145 in A. E. Derocher, G. W. Garner, N. J. Lunn, and O. Wiig, (eds.). International Union for Conservation of Nature and Natural Resources, Gland, Switzerland. IUCN/SSC Occasional Paper 19. 159 pp. Proceedings: 12th Working Meeting of the IUCN/SSC Polar Bear Specialist Group Oslo, Norway. Durner, G. M. and J. E. Gates. 1993. Spatial Ecology of Black Rat Snakes on Remington Farms, Maryland. Journal of Wildlife Management 57(4):812-826. Amstrup, S. C. and G. M. Durner. 1992. Temporal and geographic variation of maternity denning among polar bears of the Beaufort Sea. US Fish and Wildlife Service, Pages 198-206 in T. R. Mc Cabe, B. Griffith, N. E. Walsh, and D. D. Young, (eds.). Terrestrial Research: 1002 area - Arctic National Wildlife Refuge, Interim Report, 1988-1990, 432 p.
Amstrup, S. C. and G. M. Durner. 1992. Polar bear maternity denning on the Arctic National Wildlife Refuge, Alaska. US Fish and Wildlife Service, Pages 189-197 in T. R. Mc Cabe, B. Griffith, N. E. Walsh, and D. D. Young, (eds.). Terrestrial Research: 1002 area - Arctic National Wildlife Refuge, Interim Report, 1988-1990, 432 p.
Amstrup, S. C. and G. M. Durner. 1992. Responses of maternal polar bears to human activities in Alaska. US Fish and Wildlife Service, Pages 198-206 in T. R. Mc Cabe, B. Griffith, N. E. Walsh, and D. D. Young, (eds.). Terrestrial Research: 1002 area - Arctic National Wildlife Refuge, Interim Report, 1988-1990, 432 p.